If your boat or catamaran is simply too big to transport on your own, then Meier have got you covered. Whether you are moving your boat to a dry dock, mooring or are buying or selling a boat, we can offload or float your boat at your preferred destination. Depending on the width of your boat, you may need police escorts and/or pilot vehicles but generally anything from 4.5 metres + wide will need some sort of escorts. We can discuss your needs with you and provide a detailed quote that encompasses your needs. You will need to acquire your own transit insurance for the relocation of your boat but our team can assist you if you aren’t sure where to start. Contact our team today to discuss your boat relocation needs and we can provide you with an obligation-free quote and outline of the process. Road delivery is generally much cheaper than shipping or water delivery along with the added benefits that there are no major fuel costs, no risk of ocean breakdowns, no wear and tear on your boat and no wet weather delays. Whether you’d like your boat delivered to land or water, we can help you decide based on your situation. We are able to float with the incoming tide if the boat, destination and tide allows or we can simply offload on land. All boat relocations will need a route inspection to check for clearances and potential obstacles. Depending of the width of the boat will determin if you need police and escorts. Anything that is on deck should be stowed safely underneath. Anything on deck that can be secured or fastened should be so it doesn’t flap around. Anchors need to be manually secured in case of winch failure. Anything that is inside the cabin that could potential vibrate or tip off benches while on the road, should also be secured. For a boat relocation your often looking at 2 to 3 weeks. We encourage you to come and watch on the night of your removal and bring the family out as well. It really is a sight watching a boat down the road on the back of a truck, not to mention watching some of the hold your breath moments as your house is lifted over the top of a car that has been left parked in the street or lifted and tilted over bridge structures and road signs etc on our hydraulic trailer. And there is always all the flashing lights of the Police cars and pilot vehicles to keep it visually exciting for you and the kids. It’s exciting stuff. The kids will love it! To provide you with a comprehensive quote for your boat relocation, we need know the pickup and drop off points to determine the safest route and requirements on the destination end. When transporting a boat the responsibility of gaining insurance is the boat owners. We are able to connect you with a specialist to help obtain complete coverage and help with any information. We often obtain any permits related to our activity to save you time. By tapping into our expertise, your project, approvals and planning will seem fast tracked. 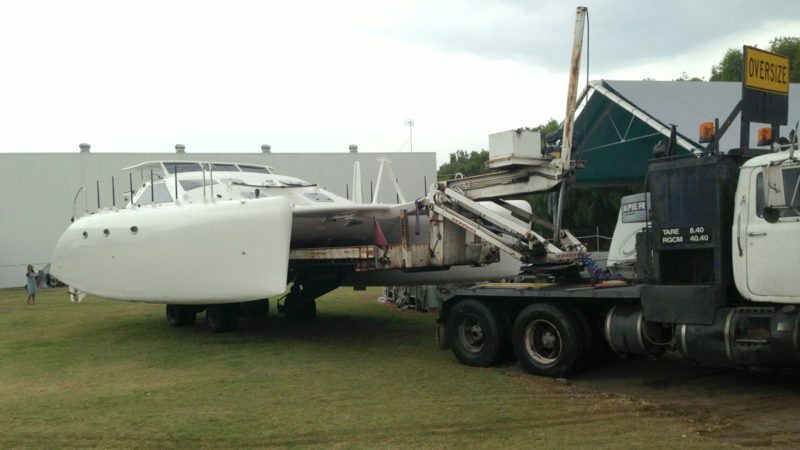 We work closely with all parties involved to make light work of boat and catamaran relocation.